I am Michael Mahoney, a full-time residential Realtor in the Boston area with eXp Realty. I have been a Greater Boston Realtor for over 17 years. It’s my mission to help people realize their form of the “American Dream” through home ownership, real estate wealth building, and real estate investment. I work in all price points. The majority of my business is repeat clients and the referral of clients from all over Eastern Massachusetts. I have sold everything from mobile homes to amazing estates. I have sold hundreds of homes in almost every town in Suffolk and Norfolk County. When asked what my specialty is, I often joke and say “from section eights to great estates”. I have been blessed to work with so many different transactions and people from all walks of life. I grew up in West Roxbury, Massachusetts. I attended St. Theresa’s Grammar School and Catholic Memorial High School. I was very active in soccer and swimming. I loved to mountain bike. I am still addicted to fresh water fishing, and have even turned my kids onto it. After CM, I studied Sociology at the Massachusetts College of Liberal Arts. As I realized I was about to be saddled with student debt, I made a decision to enlist in the Army Reserves to help defray the costs of college. I signed up for a 6 year enlistment in an infantry unit of the Army Reserve. My dad was a US Army Veteran and served in Vietnam, so it wasn’t completely foreign to me. In serving in the Reserve and spending a summer in Fort Benning, Georgia, I was able to pay for my education and acquire the tenacity I use in my job and everyday life. I never met Mr. Montgomery, but I liked his bill when it came time to pay mine at the bursars office every semester. No I did not go to Harvard, however…. As you can see from my story, I was not blessed enough to attend college in Cambridge, Massachusetts, however I got a PHd in how to work at Drill Sergeant Joshua’s Playground conveniently located at Fort Benning Georgia. 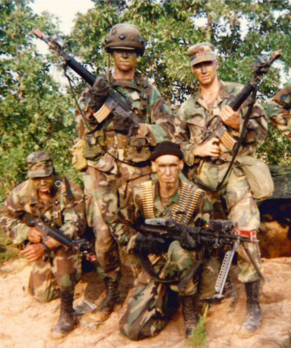 When you pay for a four year degree with a pair of boots and a rifle as a member of an infantry rifle platoon, you learn how to work, how to lead and how to go out and get things done. So the way I see it, I saved a middle class American-Irish family about 200k by staying out of Cambridge…not that I was invited anyways. Besides, they didn’t offer my favorite class “How to Grind by Drill Sergeant Joshua”. I have been a member of several business networking groups. I have served as a president in Business Networking International. I also served on the membership committee and was the education coordinator for this same group. I am one of two core founding members of The Business Alliance Network Group in Walpole, MA. I have also served as a President & Vice President for my past chapter of Toastmasters International, a public speaking organization. I bring the same initiative to Toastmasters, The Business Alliance Group and BNI that I bring to my career and in everything I do in my own life. Michael runs an event called “Make Hunger Disappear”. This event is a magic show he sponsors in the community. All proceeds from the event go to the Greater Boston Food Bank. On my desk, there is a picture that reminds me what it takes to be successful as person in this world. I have a handwritten note taped to my monitor surrounded by pictures of Iwo Jima and Abraham Lincoln that reads “The Dream is Free, The Hustle is Sold Separately. Nobody will outwork me!” End of story. Other personal motivating items to me are visiting the Lincoln Monument in Washington D.C and standing on the very spot where Martin Luther King delivered the “I Have a Dream” speech. If you are American and have not been there, what are you waiting for. It is so inspirational. I often visit Arlington National Cemetery. I have been a couple of times on Veteran’s Day. It’s moving. These icons are “holy to me” and should be for every American who believes in this country. These icons are what keep me motivated to drive on in both my real estate practice and my personal life. After college, I ended up taking a job as a computer technician at EMC in Hopkinton, MA. This position set me up for a career in the high tech industry. I then worked as a sales engineer for Boston-based high tech companies until I was encouraged to enter the real estate business after the economic decline of the early 2000’s. I took the real estate class in December 2001 while facing a new daughter and stifling car and mortgage payments. I began with Coldwell Banker Residential Brokerage. Out of the gate my career took off, and the rest has been history. I have sold over 250 homes to date. Being a Boston native my entire life and having worked in the real estate business for a decade and a half, I bring a wealth of knowledge and expertise about buying and selling real estate here in the Greater Boston area. My success is not only founded in the persistence I acquired in my academic and Army Reserve career, but also in the loyalty I supply to each and every one of my clients. The majority of clients I serve are repeat clients and clients who are referred to me. When you hire me, you will find that I listen to your needs and find out your “why”. When I fully understand your motivation, I internalize it and use it to fuel my drive myself to achieve your desired goals and outcome. As I like to say, when I “adopt you as my client” you become like family to me. I internalize your personal goal and this gets me motivated. As I say why not “burn the free fuel”. Whether I am hired to work as a buyer’s agent on your behalf or to sell your home, I work unconditionally and around the clock to get your results. I look forward to working with you in the future and helping the people in Greater Boston find the homes of their dreams and build personal wealth through real estate. What Are You Looking When You Interview Your Realtor? If you are looking for experience, expertise, attention to detail, loyalty and discretion, I am 110% sure you found the right guy. If you are looking for the country club, polo or yacht club type of Realtor, probably not your guy. If you have read this far, you have probably gathered that by now.